Although generally accepted the insects are some of the smallest of mother natures wildlife wonders. 'Insecta' (insects) are in fact the largest group of animals and represent approximately three quarters of all the animal species recorded to date. They are possibly the only animals that occur worldwide from the -40C in the Arctic Circle to the worlds deserts, with its temperatures in excess of 65C. Wildlife genre and in particular insects is a large, complex subject to delve into but basically insects are split into 3 groups as far as their 'life cycle' development is concerned, these being in the simplest of 'life cycle' changes called 'Ametabolism' in this process, young insects have the same body shape as the adult. After emerging from the egg, the insect undergoes only changes in size, but not shape, as it matures. Take that of Silverfish, they develop through 'Ametabolism'. 'Hemimetabolic' in which the metamorphosis (transformation) from the egg> nymph> and onward through the stages of development is similar to that of an adult insect and various stages of 'moults' called 'instars' (periods of change) until it reaches adulthood and is able to breed. Like that of cockroaches and locusts. The other group of insects and most common of 'life cycles' are what is called 'Holometabolic'. This group of insects once the egg has been laid go through a total transformation (Life Cycle) which unlike the Hemimetabolic orders doesn't resemble the final adult form at any stage. Like that of a butterfly or moth, which goes through the egg>larvae>pupa (Crystalist)> and then adult stages. One of the most fascinating aspects of wildlife in Africa's insect world to sit and watch is the industrious 'dung beetle', I have watch 'amazed' as these little insects roll 'dung balls' many times their own size quite freely around the sometimes quite arduous terrain. These dung beetles which as explained above come under the 'Holometabolic' group of insects. The dung beetle is further split by mother nature into those that 'roll' their dung balls and those that just move around freely, mate and and lay their eggs in dung, mainly of herbivores (animals that eat plant material). 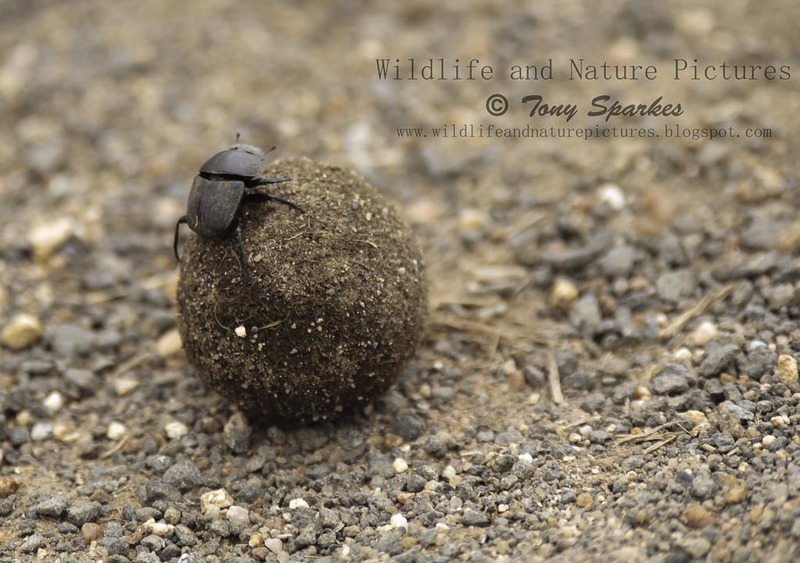 Of those that roll their dung, a male prepares a 'nuptial ball' and rolls it away with the female in hot pursuit. Once he finds a suitable spot, he digs a hole and buries the ball then both him and the female go down into the hole where they mate and eat the 'ball of dung'. Once this has been done which could take several days, either the male or female prepares a second ball of dung called a 'brood ball'. This ball is again taken into the hole and the female alone goes down into the chamber left by the first ball and proceeds to deposit her eggs 'in' the 'brood ball'. The female then goes off and closes the entrance to the tunnel to start this process again elsewhere. In a week or so the eggs hatch into 'larvae' which devours the dung ball from the 'inside' after 2 or 3 weeks the 'larvae' changes to a 'pupa' which later gives rise to an adult beetle all protected inside a 'crusted' shell which stopped the food from drying out during the life cycle process.